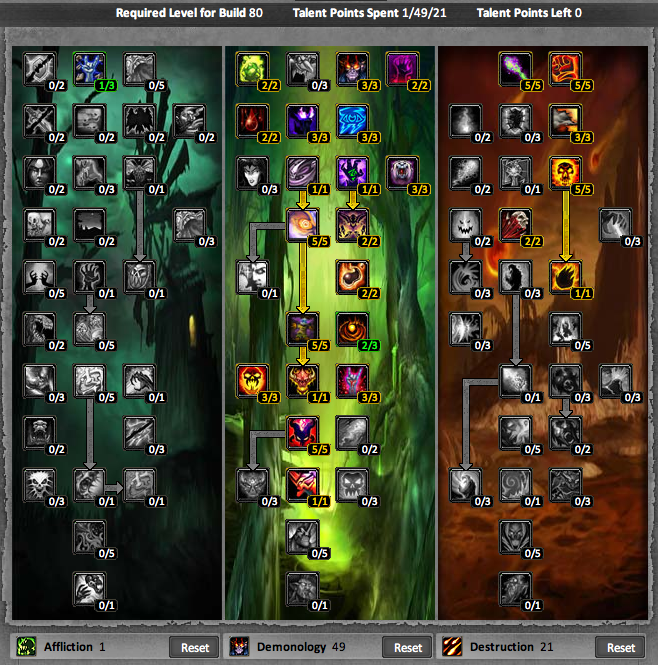 This guide contains information on which talents to choose, which spell/ability rotation you should use, what heirloom gear you should (could) use and some general tips you should use while leveling your Warlock. The best* leveling spec for a warlock is Affliction. This is because it’s both mana efficient, and focuses on greatly improving the damage of your DoTs. It is only suggested to level 50 though, because thanks to the new pet Felguard and spell Metamorphosis, Demonology clearly becomes a better choice leveling wise, because lots of survivability will be needed on the later levels. It isn’t impossible to level as Destruction, but it simply isn’t worth it neither. – Keep Demon Skin up. – Get your Imp no later than level 4. – Until you get Immolate and Corruption, spam Shadow Bolt. Rotation: Immolate, send in Imp while casting Corruption, Shadow Bolt or Wand to death. At level 8, start rotation with Curse of Agony. – Use Drain Soul when you need Soul Shards. – Wait 3 seconds after your Voidwalker begins attacking a mob to start the rotation. – Life Tap when needed. – Drain Life when needed.Rotation: Send in Voidwalker. Curse of Agony, Corruption, Immolate, Life Tap (optional), Drain Life (if needed), Drain Soul. – Replace Demon Skin with Demon Armor. – Use Any pet you feel good with. – Life Tap and Drain Life when needed. Rotation: Immolate and send in Pet, Corruption, Curse of Agony, Drain Soul. – Get your free mount! – Continue using Any pet you like. – Drain Life, Life Tap when needed. – If you feel Imp has more DPS, go ahead and use him. – Use either Voidwalker or Felhunter, your own preference. – Everything else, same as above. – Use Shadow Bolt if Nightfall procs. – For Voidwalkers, have them attack right away. – For Felhunters, send them in after Immolate. Rotation: Immolate, Corruption, Siphon Life, Curse of Agony, Shadow Bolt (if Nightfall procs), Drain Soul, Dark Pact. – At 62, switch to using Fel Armor instead. – From 50+, your rotation will be extremely messy, but you will basically just cast all your dots on your target. – I use a Felguard through these last 30 levels, due to it’s ridiculous survivability and thus being able to tank. My rotation these last few levels was (definitely not the best): Immolate > Curse of Agony > Corruption > Drain Life > Drain Soul. You should probably by now understand what DoTs are and that they are your main damage dealing abilities. So any rotation you feel good with is fine. Anyhow, if you choose to go with it, the Affliction DPS rotation for 80 instances is: Haunt, Curse of Agony, Corruption, Unstable Affliction, Siphon Life, Shadow Bolt. – Make sure you start with around 10 Soul Shards. – Give a Soul Stone to one of the healers. – I could rant on with a ton of stuff, but I’m just going to say, read this. – Carry 5 – 7 Soul Shards with you at all times and be sure to delete excess stones. There are plenty of helpful addons that do this automatically for you. – Don’t waste a bag slot on a Soul Bag: You won’t ever have enough SS’s to make it worth it. – Just heal yourself with Drain Life when you need to heal. – First aid bandages are often underestimated, but highly useful. – Use Life Tap when low on mana. Note: watch not to overdo it! You don’t want to end up dying just so that you can have a full mana bar. – The best options money wise are Skinning/Mining (Herblorism isn’t bad neither). – If you want to make your own gear,Tailoring is the way to go. Usually people get Enchanting to go with Tailoring, as the gear that you create with Tailoring can be disenchanted resulting in Enchanting skill level and materials. They are also both independent, meaning that neither of them need materials from a gathering profession (but can use). However, even they have recipes which require materials gathered or items created by other professions (NOTE: Some items, such as rods, are created by Blacksmiths and are obligatory for all Enchanter). In the following order: Spell Hit (Until capped) > Spell Power > Spell Haste > Spell Crit > Stamina > Intellect > Spirit. There are various opinions on this topic, but most Warlocks/other casters go generally by this. These same Heirloom items are also suggested for/used by Mages and Priests. Shard management (since with improved Drain Soul you’ll want to get 14% FREE MANA from EVERY MOB YOU FIGHT, who can really pass that up, and who wants to delete all those stupid shards?). It also offers warnings about unfearable mobs, audible warnings about your soulstone expiring, and nightfall procs. It also makes it a lot easier to keep a healthstone on hand, and as a affliction lock you willl also likely want to keep a spellstone up now that Wrath (of the Lich King) made them halfway decent. Also, Necrosis has a DoTimer-like feature for tracking how long your dots have left. In my eyes it totally mitigates any need for DoTimer as a lock. DoTimer – A handy mod for managing your DoTs and rotation.